To Balduin on the "Ships starting with B" page. Source: A book about Akers mek. Verksted, 1931. When named Karen, post war - Received from Sverre Johansen, Norway. Another picture of Karen, this one from Bjørn Milde's postcard collection. Built at Akers mek. Verksted, Oslo in 1921. Guestbook message from the captain's great grandson. Follow the convoy links provided for more information on each. Please be aware that some listings are incomplete. Errors may exist (this could also mean that she may not have sailed in all the convoys mentioned here), and several voyages are missing. July 14 Milford Haven   OB 184 Convoy dispersed July 18. Page 1 gives arrival Sydney, C.B., July 27. Sept. 24 Methil   OA 219 Compare w/Page 1. Dec. 20 Sunderland Southend Dec. 21 FS 365 Convoy available at link above. Not sure about the 2 entries above. Had she been scheduled from FS 379, but instead sailed in FS 381? Her voyages in this period are shown on Page 2 (also, missing movements). * July 16 Liverpool   OB 347 For Sydney C.B. *Convoy OB 347 did depart Liverpool on July 16, but according to Page 3, Balduin sailed from Loch Ewe on the 18th and arrived Sydney, C.B. on Aug. 2. The document also shows some missing movements. Nov. 22 Milford Haven Yarmouth Roads Nov. 24 WP 70 Compare w/Page 3. Dec. 19* Yarmouth Roads Newport Dec. 21 PW 83 *Page 4 gives departure Dec. 17, arrival Dec. 19. 1942 Jan. 4 Yarmouth Roads Newport Jan. 6 PW 91 Missing movements, Page 4. * I'm not entirely sure this convoy designation is correct for this voyage. *The above voyage has been taken from A. Hague's 1944 entries below. March 25 Harwich Spurn Pt March 26 FN 664 Convoy available at link above. Dec. 26 Newhaven Newhaven Dec. 27 CE 232 Put back. The above voyage has ended up in the wrong place. It belongs under 1942 above and has been inserted there. Some of these next 1944 voyages are not detailed on the archive documents and, therefore, comparison cannot be made and accuracy confirmed. Sept. 3 Seine Bay Southend  FTC 87 Page 14 gives arrival Sept. 4. Sept. 15 Southampton* Southend Sept. 16 FTC 9A *From Portsmouth. Dec. 3 Harwich Southend Dec. 3 FS 1653 Convoy available at link above. 1945 Jan. 12 Tyne Southend Jan. 14 FS 1695 See also Page 16. March 8 Southend Cowes Roads March 9 TBC 91 Also, Page 17. March 20 Methil* Southend March 22 FS 1762 *From Tyne. March 27 St Helens Roads Southend March 28 BTC 108 Again, see Page 17. Apr. 14 Poole Southend Apr. 15 BTC 126 Also, Page 17. Apr. 21 Southend Spithead Apr. 22 TBC 135 Compare w/Page 17. May 3 St Helens Roads Southend May 4 BTC 145 Compare w/Page 18. May 10 Tyne Southend May 12 FS 1802 Compare w/Page 18. May 12 Southend Spithead May 13 TBC 156 Again, see also Page 18. May 15 St Helens Roads Southend May 16 BTC 157 See also Page 18. As can be seen, she was mostly in service around the U.K. during the war, with only a few voyages across the Atlantic. It'll be noticed, when going to the various archive documents, that she occasionally had long stays in port. Judging from the information found on Page 1 of the archive documents, Balduin was in Antwerp when war broke out in Norway on Apr. 9-1940. Later that month, she's listed in Convoy OA 137, which left Southend on Apr. 27, Balduin arriving Barry on Apr. 28 (the Norwegian Vigsnes is also included). She now made some voyages to France, then in July that year she appears among the ships in Convoy OB 184. Fana, Fenris, Haakon Hauan and Polartank are also listed in this convoy, which departed Liverpool on July 15 and was dispersed on the 18th. No destination is given for Balduin, but going back to the archive document, we learn that she arrived Sydney, C.B. on July 27, having sailed from Milford Haven on the 15th (ref. external links provided within the table above for more info on the OA and OB convoys). With lumber for Inverness, she was scheduled for the Halifax-U.K. Convoy HX 65 the following month, but did not sail (as can be seen on Page 1, she did not arrive Halifax until Aug. 17 - this convoy left Aug. 12). She was also cancelled from the next convoy, HX 66 (Norne and others were sunk - follow links for details). Having proceeded to Sydney, C.B., she eventually got away with the slow Convoy SC 2 from there on Aug. 25, in which the Norwegian Gro and several others were sunk - again, follow the links for more info. 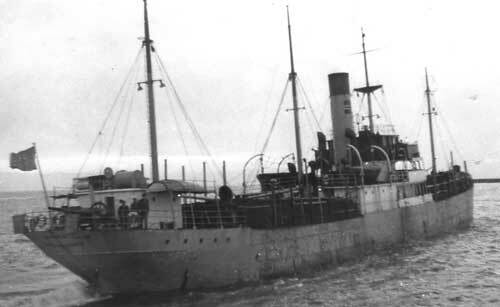 A. Hague has later included her in Convoy OA 219, from which the Norwegian Asgerd was sunk. This convoy originated in Methil on Sept. 24 (link in Voyage Record). Comparing this with the listing found on the archive document, we see that Balduin left Inverness on Sept. 25 and arrived Ardrossan on the 27th. A couple of weeks later we find her, together with Askeladden, in the U.K.-Gibraltar Convoy OG 44, which started out in Liverpool on Oct. 11 and arrived Gibraltar on the 24th; Balduin, however, was bound for Lisbon on that occasion, where she arrived on Oct. 23 (according to the archive document). OG 44 will be added to an individual page in my Convoys section, but in the meantime, the ships sailing in it are listed on the page naming ships in all OG convoys. With a cargo of pit props, she headed back to the U.K. on Nov. 20 in Convoy HG 47 from Gibraltar. Her destination is given as Sunderland, and she arrived there, via Oban and Methil Roads, on Dec. 11. Her 1941 voyages start on Page 2 and continue on Page 3. Skipping now to July-1941, when she's listed in station 95 of Convoy OB 347, which left Liverpool on July 16 and was dispersed on July 31. Her destination is given as Sydney, C.B., where she arrived on Aug. 2, having sailed from Loch Ewe on July 18. The Norwegian Akabahra, Astra, Bjørkhaug, Fido, Gudrun, Hestmanden, Leka, Marga, Maridal, Orania, Siak, Spes and Sveve are also listed, as will be seen when following the link provided in the table above. Having made a voyage to Nelson, N.B., Balduin went back to Sydney, C.B., and Arnold Hague now has her returning to the U.K. with the slow Convoy SC 41, which left Sydney, C.B. on Aug. 24 and arrived Liverpool on Sept. 11 - Balduin stopped at Loch Ewe that day. She had a cargo of lumber and sailed in station 24. This convoy is not yet available among the SC Convoys included on my website, but will be added; see ships in all SC convoys. It also had several other Norwegian ships, namely Akabahra, Astra, Audun (from Iceland), Blink, Carrier (returned), Einvik (sunk, follow link for details), Evviva, Fagersten, Fanefjeld, Grado, Gudrun, Heien, Hestmanden, Hildur I (the latter 3 from Iceland), Ledaal, Leka, Lom (also from Iceland), Marga, Nesttun (from Iceland), Orania (returned), Reiaas (from Iceland), Siak and Spes. 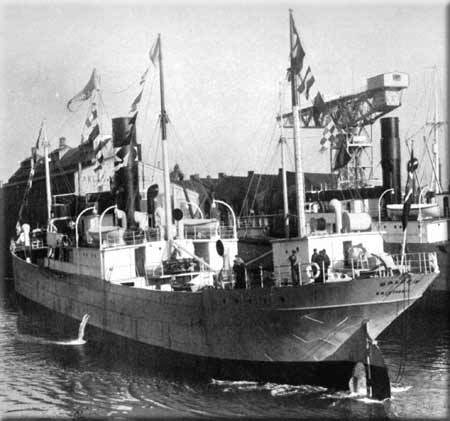 Balduin was one of about 50 Norwegian ships taking part in the invasion of Normandie; According to "Nortraships flåte", she arrived Gold Beach on June 15-1944. Arnold Hague has included her, together with the Norwegian Ara, in Convoy ETC 9, which departed Southend on June 14-1944 and arrived Seine Bay on June 15. As will be seen when going to Page 19 of the archive documents, she got to go home to Norway already at the beginning of July-1945, making several voyages home before that year was over. See also Page 20 (shows voyages to Apr.-1946). More information on the other Norwegian ships mentioned here can be found with the help of the alphabet index at the end of this page, or via the Master Ship Index. Sold in 1953 to Johan Amundsen & Søn A/S, Haugesund, renamed Karen. Sold in Dec.-1967 to Greece and renamed Cretan Wind. Delivered for breaking up in Aug.-1969. Back to Balduin on the "Ships starting with B" page. Other ships by this name: Fred. Olsen had previously had another ship by this name, built 1899, 1059 gt, sunk May 1-1915 by the German U 39 in position 56 58N 03 15E, while on a voyage from Drammen to London with a cargo of paper, timber and wood pulp. They also had a motor vessel by this name later on, built in Oslo 1955, sold in 1972 to Vatnetind A/S, Ålesund, then a 4th Balduin was built in Florø in 1975 (along with the sister ships Bayard [VII] and Bohemund, all 3 being RO-RO ships).